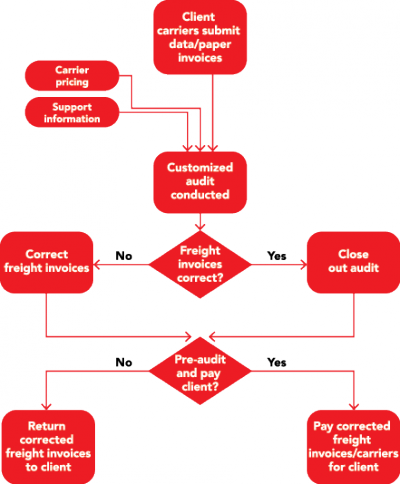 Our freight pre-audit service focuses on auditing freight records before a client sends out payment. A complete audit is conducted with corrected invoices being returned to the client. This service is for clients that want to keep payment activities in-house. Our freight pre-audit and pay service simply goes one step further with AMTR making final payments to carriers on behalf of the client. Eliminate overpayments due to carrier billing errors, duplicate payments, etc. AMTR’s pre-audit/pre-audit & pay services are targeted at small/medium shippers that do not ship enough volume to benefit from a large, pre-payment firm and that may need an outsourced transportation function.